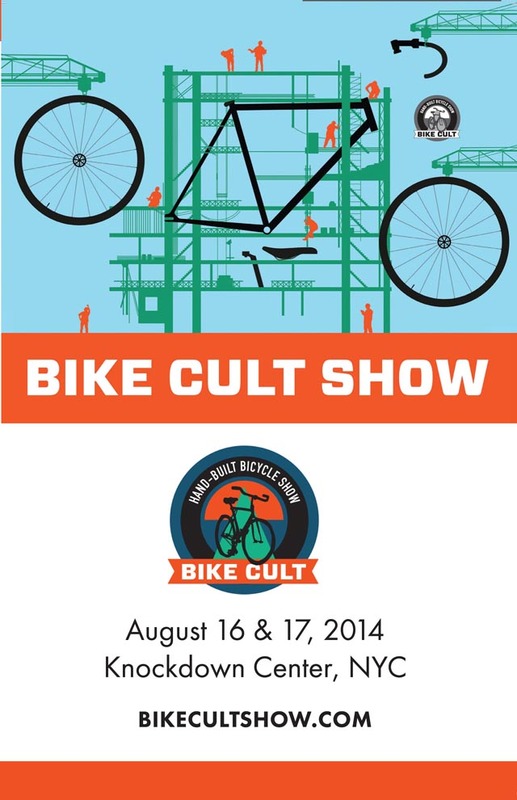 We held the 2nd Annual Hand-Built Bicycle Show at Knockdown Center August 16-17. 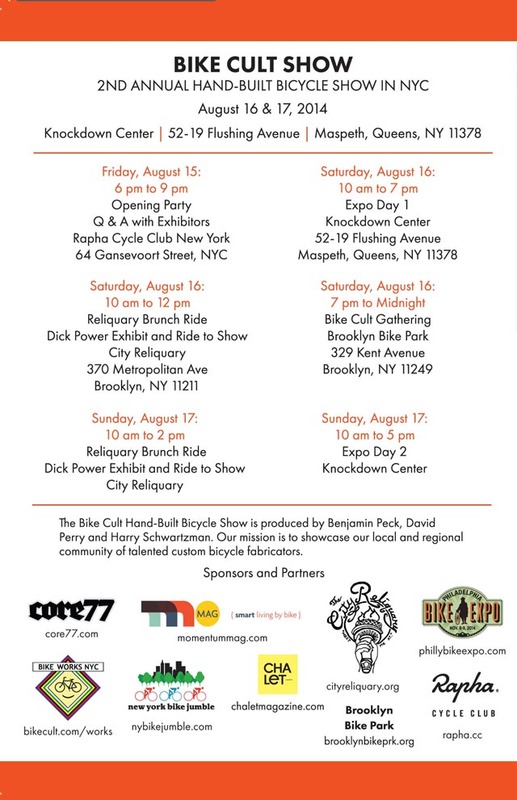 Produced by Harry Schwartzman of Brooklyn Bike Jumble, with Ben Peck of Benjamin Cycles and Dave Perry of Bike Works NYC. Acme bike fit with Guru TT bicycle. Acme showed Boo bicycle with bamboo and carbon fiber. Acme displayed Parlee bicycle with carbon molding. Benjamin with Johnny Utah bike and surfboard rack. Cole Bennet with classic mtb fork. Breismeister with art and design. Ceremony with reunion of scorcher and master road. Chapman with a mixte and routier. Coarse with cool track bikes. Coast with classical fillet-lug-coupler work. Hillel Eflal with high-end tall bikes. Horse with design project bike. Kinfolk with retro crafty works. NYC Velo with Indy Fab and Dario Pegoretti. Eric Owens with D2R2 rando prototype. Rick Jones with spouse, cross and mtb bikes. Royal H with colorful disc cross and road lugs. SquareBuilt with 650c size fixie, polo and crash worthy road bikes. 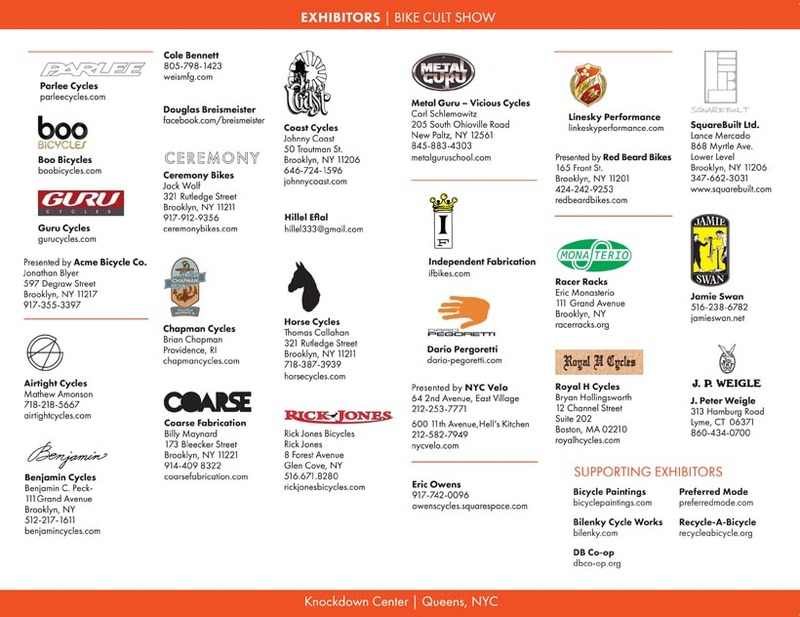 Metal Guru - Vicious Cycles with bike building and paint classes. P.J. Weigle with blues, jazz and soul. Bicycle Paintings with Bologna cargo bike.